Hand shape linked with Extraversion! Early findings for a female sample had indicated that hand shape is a key-element for recognizing Extraversion/Introversion. Likewise results are now available from a male sample! 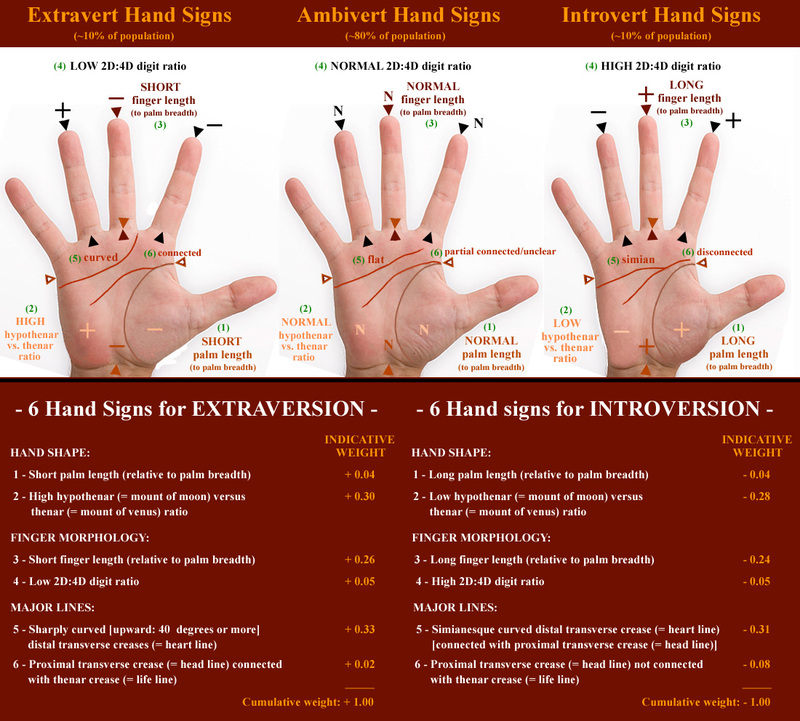 The findings indicate that the so-called 'Fire hand shape' (= short fingers + large long palm) is more common in Extraverts, while the so-called 'Water hand shape' (= long fingers + small narrow palm) is much more common among Introverts. 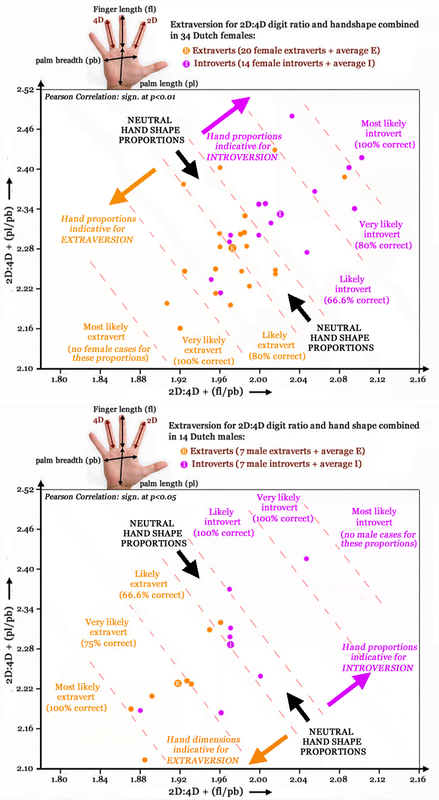 Many more details on the measurements & findings are presented at HandResearch.com inside the article: Introverts have longer fingers, Extraverts have wider palms! PS. Be aware: most people can best be described as 'ambiverts', but the results of this study results from a comparison between 'extraverts' and 'introverts' ('ambiverts' were excluded!). Re: Hand shape linked with Extraversion! Interesting and true, I think, I have found introverts in the water hand and earth hand, but most extroverts in the fire and air. It's kind of related to the astrology as well with these personality types, the water and earth are generally quiet, where the air and fire seek attention. Hi Sari, thanks for sharing your experience on this matter! 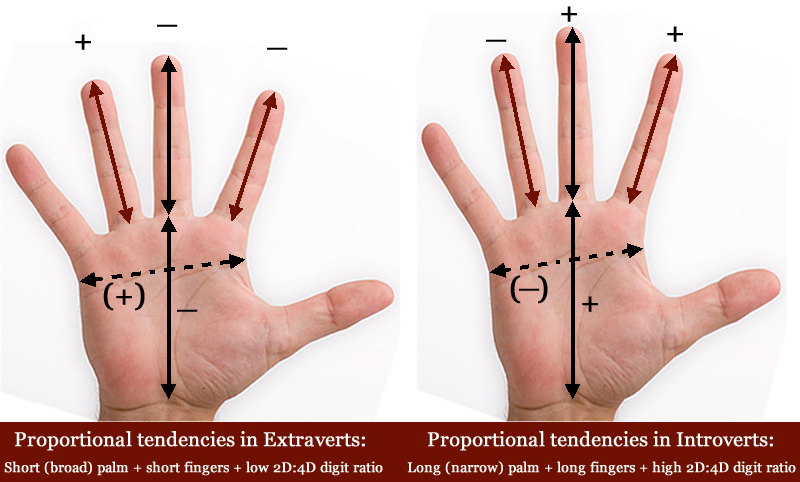 ... Just added a visual impression of the finger length variations between extraverts and introverts (in an international perspective), and it shows why the 'hand index' is an important measure to discriminate extraverts from introverts.